This how-to covers the basic principles for preparing and applying limewash, along with recipes for the Primer coat, Wash coat and Patina coat. This article contains two recipes: one using dry lime powder, and one utilizing wet lime putty. Dry lime powder refers to our High Calcium Hydrated Lime. This is a high quality, high purity dry lime powder. It is not the same as agricultural lime from a garden center. Lime Putty refers to wet lime in a bucket. This includes both pit lime from a factory and Hydrated Lime powder that has been slaked by the consumer. Hydrated Lime should be a bright white powder, not more than two years old. 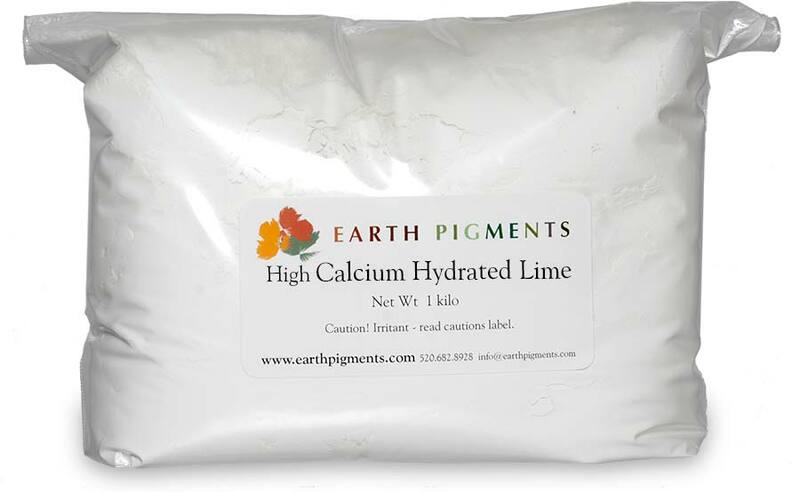 We carry the purest, highest purity food grade High Calcium Hydrated Lime. Lime Putty should be stored in a sealed bucket with at least 1 inch of water on top of the putty to protect it from exposure to the air. In cases where the substrate is very tightly bound, or when the greatest transparency is desired, factory produced Lime Putty is preferable over powdered lime. When it is chemically compatible, lime will not adversely react with the surface, causing the two to separate, (the lime flakes or falls off). When mechanically compatible there is sufficient porosity and texture – often referred to as "key" – to allow the lime crystals to expand, "lock" onto and penetrate the surface. Limewash has rigid requirements when it comes to suitability with a surface because it is a thin coating. As with lime plasters, the supporting surface must be able to withstand a pH of 12 or more. Commercially prepared acrylic reinforced lime washes with compatible primers are often the only alternative for surfaces such as previous paint. Gypsum plasters are not compatible with lime wash, but they can accept Casein based paints such as Milk Paint and Casein Borax Paint. These paints are translucent and can create the matte appearance of lime wash. Conditions for application are the same as for lime renderings. Proper temperature and humidity are required for the carbonation process to be successful – the most critical period for carbonation is the first two to three days. Ambient temperature should not be below 41 ºF (46 ºF for dark colors) at any time during the application or carbonation process. Do not allow freezing to occur. In temperatures above 86 ºF or in very low humidity, surface and subsequent coatings must be misted with water. Exterior coatings should be protected from wind and sun to protect it from drying too quickly. 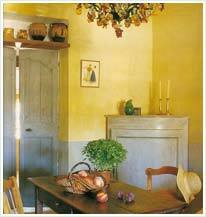 An opaque covering such as damp canvas or burlap works particularly well. Surfaces must not have a surface temperature below 41 ºF (46 ºF for dark colors) and must not be excessively hot or excessively wet. First, the surface must be fully set. Very smooth surfaces that don't have enough tooth (roughness) for the lime to bond with may require texturing with medium abrasives or a wire brush. Dust and loose debris should be removed by brushing or dusting, and then washing. Second, the surface must be assessed for the proper dampness. A light dampness is desired – too much moisture on the surface will interfere with cling and coverage. Dampness can be influenced by the porosity of the surface, as well as humidity and temperature. It shouldn't absorb the primer, wash or patina coat so quickly that it dries almost immediately after being applied. It also may be necessary to mist before subsequent coats are applied. Misting, (prewetting) can easily be accomplished using a plastic spray bottle, pump sprayer or, on exterior projects, a garden hose with a suitable mist nozzle. For mixing, use a plastic bucket with lots of "headroom". Since lime is caustic, it can cause "burns" to skin and eyes. Make sure you wear suitable clothing, (long sleeved shirt & long pants, cover-alls, etc.) rubber gloves, shoes and eye protection. Slowly add powders, (lime, pigment or additive) to water, not water into powder to minimize dust. Avoid inhaling airborne powder during mixing and USE A DUST MASK! Mix only the amount of limewash to be used in one day. Larger quantities should be mixed with a paint paddle mounted to an electric drill. 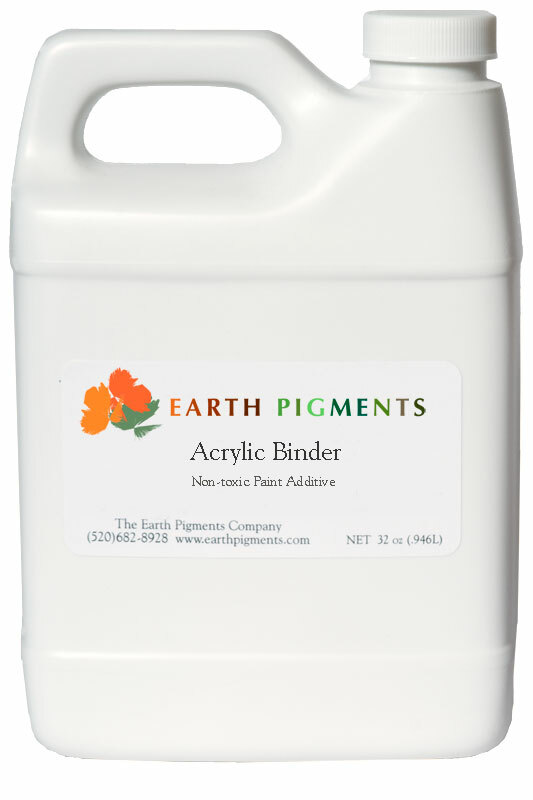 Within the recipes there are suggestions for additives, (additional binders) to enhance the adhesion of limewash. They won't alter the appearance or breathability of a limewash, and since they provide additional insurance your limewash will be successful are highly recommended. One important rule: always add the same ratio of additive for each successive coat. Additives are important in exterior applications due to weather exposure. Additives are important in interior applications as well as a limewash that powders off in an interior space is not healthy. Choose brushes made specifically for limewash, or a 4" Poly/Nylon paint brush. A sponge can also be helpful to apply patinas and soften brush marks if desired. Lime is hard on tools – be sure to rinse all brushes thoroughly after use and hang to dry as the metal of the ferrule will be prone to rust. You may need to "retire" several brushes over the course of a large project. Lime and/or pigment particles will NOT remain suspended in water for long and MUST be frequently agitated. This is very important! During application of the Primer Coat, a paint stir-stick should be used at regular intervals. During application of wash or patina coats it is best to transfer portions of your freshly agitated mixture to a shallow container so that your brush bristles can touch the bottom and with each pass of the brush you can sweep the lime and pigment particles back up into suspension. Lime wash should be worked down into the surface using a brush in a cross-hatch motion (also known as figure eight or butterfly.) This creates a more pleasing appearance than using a simple up and down motion with the brush. Brush marks can be left on the surface for added interest, or can be blended with the brush or by the use of a damp sponge. Sponges can also be used to apply a different color to specific areas, usually in the Patina Coat. Several thin coats are the key to success – never apply too thick. For exteriors, 5 coats are recommended. For interiors, 3 coats or less depending upon the effect desired. In the Fresco technique, limewash is painted onto fresh, set, wet plaster. This technique requires that the surface be hardened enough so as not to deteriorate as it is being brushed, but not too dry as to inhibit proper adhesion of pigments with the lime in the surface. Technique and climatic conditions play a major factor in application success. Read a detailed discussion of the Fresco Technique. This recipe is broken down into three parts: a Primer Coat, a Wash Coat and a more translucent Patina Coat. Coverage estimate is 110 sq feet dependent upon absorbency of substrate. Coverage estimate is approximately 220 sq feet. 1. Additives are used to promote adhesion of the wash or patina coats, (you must use the same additive for all coats of Wash and Patina). The subject of lime coatings is more extensive than is presented in this short article but we hope this information will help you understand the basics. Application techniques, variations in lime types and the many visual effects possible make limewash a fascinating topic for further research and experimentation.